Combination of Vertical Menu and Main Mega Menu helps customers to have better tool for their shopping. Getting more excited with what they will see in the menu – links / images / video. One thing you shouldn’t miss out is Web Responsive Design that automatically changes its width according to screen resolution. No need extra versions for customers who surf on smartphone or tablet. All in one template is enough. 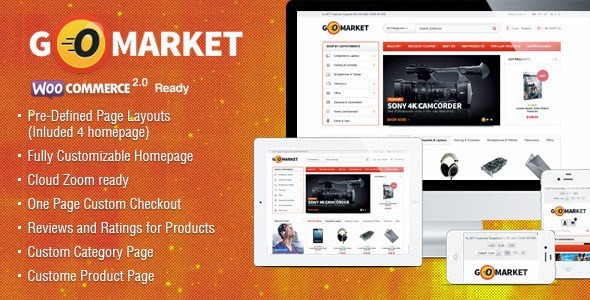 Item Reviewed: WooCommerce Supermarket Theme - GoMarket 9 out of 10 based on 10 ratings. 9 user reviews.